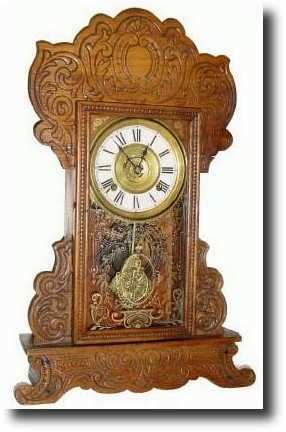 C.1910, Waterbury HILLSDALE oak kitchen shelf clock in generally good restored condition, minus alarm mechanism. The pressed oak case has been stripped and refinished to a light walnut color. The dial has been repapered. Although the central alarm disc is present, the lower spring alarm is missing. Ticks and strikes, height 22"